As the suppressive policies of Al Khalifa continue against Bahraini citizens, including killing, execution, taking the dead bodies of the martyrs hostage, compulsory burial, and prevention of holding funerals, the deputy general-secretary of Al-Wefaq National Islamic Society Shaikh Hussain Al-Daihi said that by attacking Ayatollah Sheikh Isa Ahmed Qassim’s house, the regime announced disconnection from the majority of the people of Bahrain. Al-Daihi believes that attacking the people brutally, Al Khalifa aims at damaging the unity of the people and depriving them of basic rights and freedom and calls for more sympathy with the victims’ families. 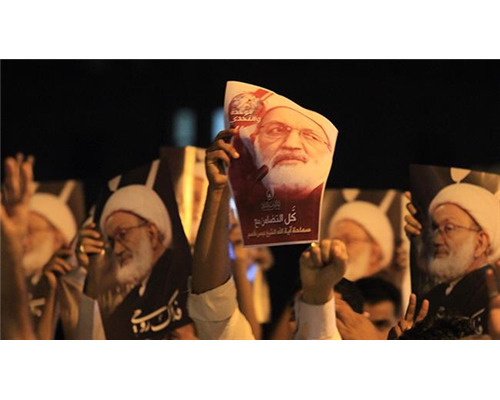 The security forces of Al Khalifa attacked Sheikh Isa Qassim’s house and arrested him. They killed five, injured 200 hundred and detained 286 people, according to the media. According to the human rights center of Bahrain, attacking Sheikh Isa Ahmed Qassim is tantamount to declaring war against the political majority and attacking all the Bahrainis, and will have disastrous consequences for which Al Khalifa will be responsible for. The shameful silence of the Arab world and others against these crimes and some Saudi-dependent media’s aiding and abetting Al Khalifa to cover up the crimes and bloodshed are happening in Bahrain while Al khalifa once again showed that they are not looking for a peaceful method to solve the domestic problems and are still insisting on their stubborn approach. Deployment of military equipment near Sheikh Isa Ahmed Qassim’s house and other unconsidered actions not only destroy any chance for creating a political method to solve the problems in Bahrain and obscure political future of the country but also endanger the stability in the region. Al Khalifa actions most probably will more than ever intensify the security atmosphere of Bahrain and increase the peaceful protests.